#ArtProject meets Status to bring our communities together and place Art and Design where it belongs: In front of the eyes of as many people as possible! By creating an open call for artists and designers to submit T-shirt art and designs that will be printed and distributed in blockchain events around the world. Our communities are dedicated to the celebration and circulation of the cultural uniqueness and the artistic forces brewing in the crypto space. With this collaboration we aim to expand the reach of art across the blockchain ecosystem! An impactful medium of dissemination of visual content and identity in the crypto scene takes place in the form of T-shirts. We want to honor this tradition and bring visibility to the artists building the cultural layer of the overall blockchain community. Cool! 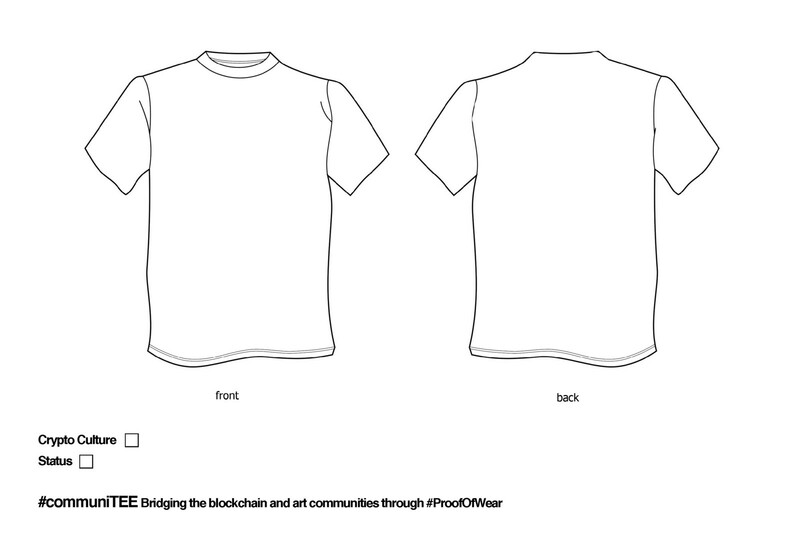 Just curious… In what blockchain events will the tees be distributed? Ten preselected designs will be displayed on a screen at ETH Berlin where people will be able to vote using a Status developed app. The selected and printed #communiTEES will be freely distributed at ETH San Francisco and the Status Hackathon prior to Devcon4 in Prague. We are considering bringing the #communiTEES to other places and get the hashtag #ProofOfWear buzzing! Ahem… is there a prize for the winning piece? Yes! Each one of the 10 finalists will receive $250 USD worth of SNT and the two winning designs will be awarded and extra $1000 USD each worth of SNT. Note that pre-selected artists will be given exposure throughout the status.im and artproject.io communities, up and down, left and right! It’s a hashtag created to be used when your #communiTEE is distributed. Once people have tees in their possession they will be encouraged to post pictures of themselves, or others spotted around, wearing our T-shirts throughout different events. This hashtag may lead to a new round of fun interactions with the community. Let’s see where this takes us. We are #ArtProject, a creative initiative by Truebit.io and artist Jessica Angel to bring the art and blockchain communities into fostering art creation, experimentation, and fundraising. #ArtProject’s current endeavor is the Dogethereum Bridge. We are also bringing art to different places in the blockchain space. Status is a community driven project that is creating a new type of network governed by its own users. They are supporting other art platforms like Pixura through their incubate program, and they are currently collaborating with #ArtProject in the creation of interactive pieces to be displayed inside the Dogethereum Bridge. Our friendship dates from eons back! THIS IS AWESOME, I WANT TO APPLY! 1) CRYPTO CULTURE — An artwork or design that speaks about the culture around crypto. This is a very wide concept and you can explore it from any perspective. 2) STATUS — Play around and feel free to restructure the Status brand in a fun and creative way. Learn about their values to gain some context and their graphic assets here. You can also start from scratch and create something entirely new. Use the template below to design your tee. Mark with an X symbol what category your design belongs to. This option is on the template. The #CommuniTEE is your canvas, use it creatively by placing your design in any way, shape, or form! How are the designs selected? Submissions made via Twitter, Status chatroom, or Telegram will be reviewed by Jessica Angel, who will select ten finalist designs to go to ETHBerlin. These selected pieces will also be posted on twitter during a 10 day period, so the community will also be able to vote for the winning pieces. How do people vote on Twitter? LOOKING FORWARD TO SNEAKING IN YOUR NIFTY ART INTO ALL POSSIBLE CRYPTO EVENTS! In collaboration with artist Jessica Angel, TruBit's first art project will use high impact, immersive and interactive art to foster community participation and reflections around the pioneering work in the blockchain ecosystem.